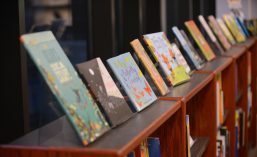 It’s that time of year again: Join the Butler Children’s Literature Center for our annual book sale! On Tuesday, December 15, the Butler Center (Crown 214) will be staffed from 10:00am-6:00pm and we want YOU to come join us for cookies, cider, expert recommendations, and BOOKS! If you’re looking to build your personal book collection, stock up for your school or public library, buy some holiday presents for your loved ones, or just want to check out the best books for kids and teens from 2015, you won’t want to miss this opportunity. Hardcovers are $8 each (two for $15), paperbacks $3 (two for $5). Cookies and cider are free! Cash and checks are welcome. ← B3 for November: Kids’ Books about Music on 11/10, 6-8 p.m.!